← April 18th Workshop Coming Soon – Register Now! 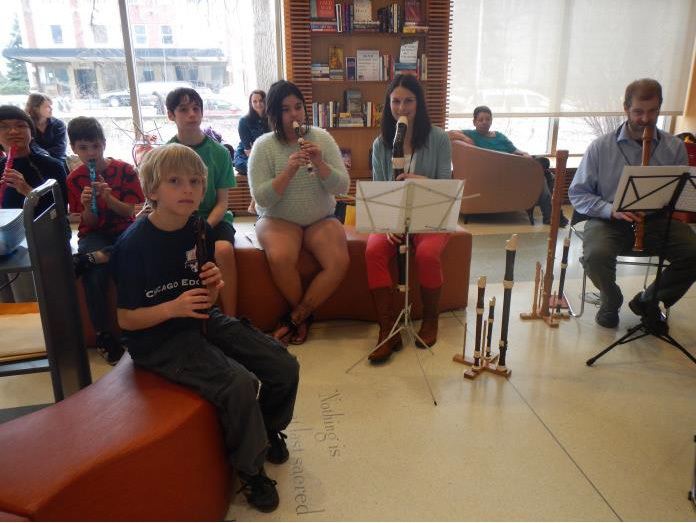 Our March meeting at the Oak Park Library featured some of the children from Roosevelt Middle School in River Forest and Longfellow Elementary in Oak Park. We had a lot of fun listening to them and hearing them play. Thank you, Pam Wiese and Mona Mann for arranging this. On April 19th at 2 PM we will return to our usual location for our monthly meeting at Covenant Presbyterian Church, 2012 West Dickens, Chicago. Lisette Kielson will be directing. No doubt we will be full of energy after Tish’s wonderful workshop the day before!, and so we will celebrate and honor Alice Maguire, playing her composition that won the chapter’s Composition Competition. Also at the meeting, we will decide whether we would like to perform a couple of pieces at the May Meeting’s Spring Concert and/or perform in June at Make Music Chicago. The performances will comprise of music from the October Meeting, “Klezmer, Tango,” and the “Greatest Hits” from the January Meeting. Look on the chapter web site https://chicagorecorders.org/events for the music. Scroll down to Meeting Downloads.